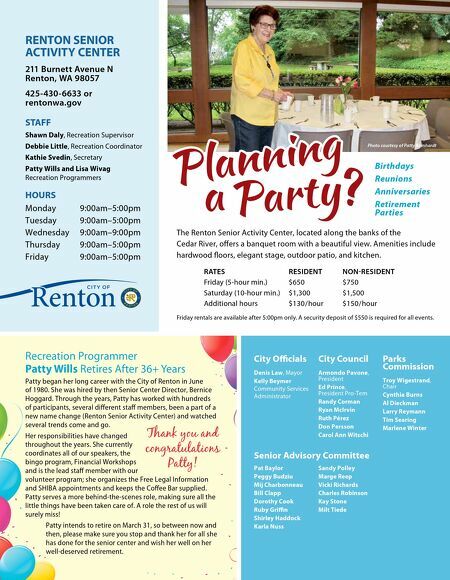 RENTON SENIOR ACTIVITY CENTER 211 Burnett Avenue N Renton, WA 98057 425-430-6633 or rentonwa.gov STAFF Shawn Daly, Recreation Supervisor Debbie Little, Recreation Coordinator Kathie Svedin, Secretary Patty Wills and Lisa Wivag Recreation Programmers HOURS Monday 9:00am–5:00pm Tuesday 9:00am–5:00pm Wednesday 9:00am–9:00pm Thursday 9:00am–5:00pm Friday 9:00am–5:00pm The Renton Senior Activity Center, located along the banks of the Cedar River, offers a banquet room with a beautiful view. Amenities include hardwood floors, elegant stage, outdoor patio, and kitchen. RATES RESIDENT NON-RESIDENT Friday (5-hour min.) $650 $750 Saturday (10-hour min.) $1,300 $1,500 Additional hours $130/ hour $150/hour Friday rentals are available after 5:00pm only. A security deposit of $550 is required for all events. Birthdays Reunions Anniversaries Retirement Parties Photo courtesy of Patty Bernhardt City Officials Denis Law, Mayor Kelly Beymer Community Services Administrator City Council Armondo Pavone, President Ed Prince, President Pro-Tem Randy Corman Ryan McIrvin Ruth Pérez Don Persson Carol Ann Witschi Parks Commission Troy Wigestrand, Chair Cynthia Burns Al Dieckman Larry Reymann Tim Searing Marlene Winter Senior Advisory Committee Pat Baylor Peggy Budziu Mij Charbonneau Bill Clapp Dorothy Cook Ruby Griffin Shirley Haddock Karla Nuss Sandy Polley Marge Reep Vicki Richards Charles Robinson Kay Stone Milt Tiede Recreation Programmer Patty Wills Retires After 36+ Years Patty began her long career with the City of Renton in June of 1980. She was hired by then Senior Center Director, Bernice Hoggard. Through the years, Patty has worked with hundreds of participants, several different staff members, been a part of a new name change (Renton Senior Activity Center) and watched several trends come and go. Her responsibilities have changed throughout the years. She currently coordinates all of our speakers, the bingo program, Financial Workshops and is the lead staff member with our volunteer program; she organizes the Free Legal Information and SHIBA appointments and keeps the Coffee Bar supplied. Patty serves a more behind-the-scenes role, making sure all the little things have been taken care of. A role the rest of us will surely miss! Patty intends to retire on March 31, so between now and then, please make sure you stop and thank her for all she has done for the senior center and wish her well on her well-deserved retirement. Thank you and congratulations Patty!